This Derick Brassard T-Shirt is the perfect addition to any Ottawa Hockey fan's wardrobe! About: The ultimate in comfort and intensely soft, our Premium Tri-Blend shirt is our most popular apparel style! This vintage graphic tee has knitted striations similar to your comfy P.E. t-shirts when you were young. They have a 1x1 bound crew collar and are constructed of 50% Poly, 25% Cotton and 25% Rayon. Why Buy a 500 LEVEL T-Shirt? 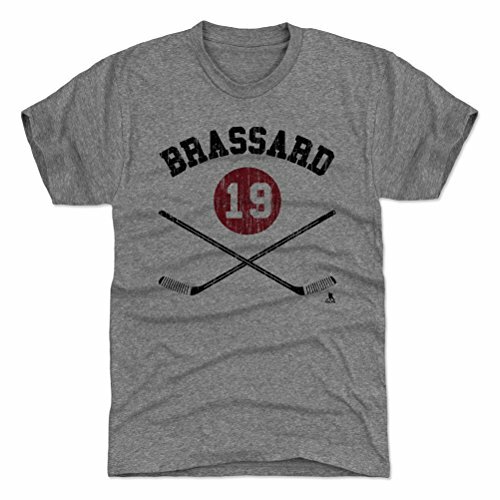 Ottawa Hockey Fan Gear and Apparel Officially Licensed by the NHL Players Association Proudly And Meticulously Made In Austin, TX Custom Artwork: Passionately Designed by 500 LEVEL artists Derick Brassard apparel and accessories are custom and made-to-order, please allow up to 7 business days for shipping. Thank you!